The Armor A65 incorporates ultra-rugged rubber casing and internal suspension system, which enables perfect buffer effect and assures rigid protections against crushes, vibrations and shocks. Type C Connector for Next Generation Devices The Armor A65 Type C Series comes with two cables – USB C USB Type A, which allows the use across multiple platforms. That means you can transfer data more easily between A65, USB based devices, and USB C ready devices. IP67 Waterproof Protection The Armor A65 is the industry first IP67-rated portable hard drive which can completely protect against dust penetration and up to 30-minutes of water immersion at depths of up to 1 meter. Cable-carry Design Never lose your cable again! The A65 is equipped with the cable storage design which allows you to tuck your cable on the back of the drive without losing it anymore. Anti-slip, Anti-scratch The Armor A65 exercises the special surface design that can not only allow anti-slip function but also keep the drive from damages caused by fingerprints and scratches. Ultra-fast Transfer Speed SuperSpeed USB 3.0 interface enables fast speed performance to quickly transfer large files including HD videos, high-resolution photos and great numbers of documents in seconds. Full Disk Encryption with SP HDD Lock Utility SP HDD Lock Utility free-download software is provided to enable full disk encryption that promises higher data security with its disk password protection. 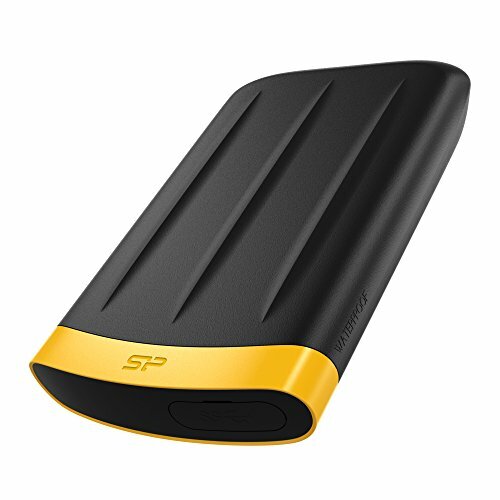 SP Widget Software Organizes Your Files Smartly The Armor A65 comes with SP Widget, the exclusive free-download software that provides various functions such as data backup restore, AES 256-bit encryption and cloud storage for efficient data management. 3-year Warranty The Armor A65 is backed by a 3-year warranty that guarantees complete services and technical support. *SP HDD Lock Utility and SP Widget can be downloaded via SP official website.